It’s of little surprise that as the Harry Potter franchise has evolved over a decade and eight films it has become almost customary, when discussing the series at any length, for reviewers to reflect on the effect of watching the series’ three principal stars growing up before our eyes. Indeed, actors Daniel Radcliffe, Emma Watson and Rupert Grint haven’t simply added 10 years, they’ve gone from not-quite (or in Grint’s case just-barely) teens to legitimate young adults, and their characters, Harry Potter, Hermione Granger and Ron Weasley, have mostly matured in kind, along with the series’ themes. (Not to mention that when those of us unfamiliar with J.K. Rowling’s novels found ourselves befuddled by bludgers and beaters, the slow transformation of the series’ heroes from wide-eyed sprites into rugged adventurers became safe ground – something we all understood.) One might think then, with all this talk of growing up, that it wouldn’t be a shock to arrive at the final film of the series and realize how much Hogwarts has aged, but as Harry Potter and the Deathly Hallows: Part 2 opens the de-evolution of the school of magic packs a wallop. In the opening shots, new headmaster Severus Snape (Alan Rickman) watches from above as students march through the courtyard with military uniformity and purpose – a Nazi-esque image that was impossible to imagine amidst the Disney-esque enchantment of the first film. The once fanciful castle of possibility is now a dim, grim prison of hopelessness. And before long, it becomes a fortress for war. If you’re searching for clues as to why the wand-blasting action of this final installment is more powerful and exhilarating than in any of the previous films combined, look no further. One of the series’ weaknesses has always been the ambiguity of all the spell-casting. The limits of these sorcerers, whether young or old, good or evil, has never been made clear, and all too often it’s seemed as if the only way to win a wand duel is to catch one’s opponent napping, given that each bolt of hocus pocus has the curious habit of perfectly neutralizing another. All these movies later, I still don’t understand how much credit goes to the wizard or the wand, and it’s always puzzled me that Harry, the chosen one, seems in constant need of protection from a fight. (I always pictured Harry as closer to Superman than Frodo Baggins, but maybe I’ve had that wrong.) Having said that, one thing all of us can understand without a PhD in Rowling is what it means to fall back on one’s last line of defense. As noted by Hokahey, in this grand finale Hogwarts becomes the Alamo – a fitting comparison not only because Voldemort and his almost limitless henchmen descend upon the castle like Santa Anna and his army, but also because Hogwarts was in its own way, like the Alamo, a place of worship before it became a stronghold. Many of us may not grasp whether Voldemort is growing stronger or weaker, whether Harry & Co are on the verge of victory or defeat, or what it actually means to destroy a horcrux. But it’s universally understood that if Voldemort seizes control of Hogwarts, he wins not just the battle but the entire war. So it is that Hogwarts becomes the most significant character of the finale, featuring prominently in many of the film’s best scenes, which also include some of the series’ most convincing and thoughtful CGI. There’s an awesome moment in which a hoard of snatchers scurries over the ground like an army of ants, narrowing to almost single-file in order to invade Hogwarts through its long covered pedestrian bridge, while in pursuit of the courageous Neville Longbottom (Matthew Lewis). Just before that there’s a terrific sequence that begins with a bird’s-eye view of Lord Voldemort (Ralph Fiennes) walking through the parted ranks of his army to a hilltop overlooking Hogwarts and ends, after the camera swoops out over the valley, with a tight close-up of Voldemort’s memorable noseless face. And before both of those there’s a thrilling sequence in which the Hogwarts elders band together and point their wands toward the sky to create a protective dome of light over the castle while, under the command of Professor McGonagall (Maggie Smith), warrior statues come to life and assemble at the school’s front gate to challenge whatever is on the way. Alexandre Desplat’s score nimbly shifts from mournfulness to adventurousness throughout the film, but it’s never better than in this preparation sequence, when it captures the epic consequence of the imminent battle and by doing so conjures the gravity of emotion that so many non-readers have struggled to find in the series. 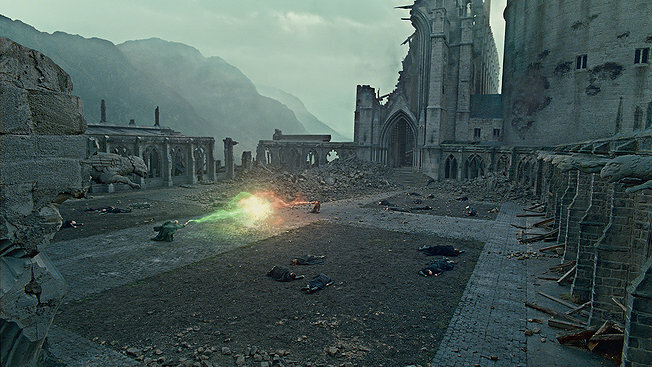 Whereas so many epic CGI battles are waged by an endless supply of insignificant pawns on irrelevant territory (think: The Lord of the Rings trilogy), this final grand clash in the Harry Potter series is waged by mostly familiar characters on decidedly sacred ground, and that makes all the difference. None of this is to imply that Deathly Hallows 2 doesn’t have some of the same old problems of its predecessors. For starters, even with screenwriter Steve Kloves and director David Yates assuming that we understand the crux of the horcrux quest, the finale can’t ditch the breathless yet cryptic plot exposition that has defined the series. Meanwhile, the film’s moments of romance are clumsily inserted. And its one-liners are silly without pleasing. And there are too many scenes in which poor Hermione and Ron can do nothing more than stand behind Harry with their arms at their sides and Very Concerned expressions on their faces. And some of the tasks that are prefaced by a lot of handwringing are resolved effortlessly. (“I can’t,” Hermione says when Ron tells her she needs to destroy the last horcrux. But Ron insists she must. And then she does. And, well, that wasn’t so hard, was it?) And yet the finale also provides another dose of some of the series’ greatest pleasures, like the way Rickman’s dramatic-as-ever Snape makes “hour” a two syllable word, and the way Fiennes’ Voldemort extends a wand delicately between his index and middle fingers as if his evil spells are enhanced by a feather-light touch, and the warmth with which Hermione hugs Harry, and so on. Late in the film, when Harry washes his face in the giant contact lens in Dumbledore’s old office and gazes back into the past, I couldn’t help but admire the way that Yates could insert a character’s significant backstory into the plot without halting the narrative’s momentum. It’s things like these that have been too easy to take for granted. So it is that Hogwarts becomes the most significant character of the finale, featuring prominently in many of the film’s best scenes, which also include some of the series’ most convincing and thoughtful CGI. Jason, this is well said, and I agree. The long shots of the besieged Hogwarts are just as dramatic, sometimes more dramatic, than the shots of familiar characters in combat. I agree here as well - But now that it’s come to an end, I find myself tuned into the finale’s strengths rather than its weaknesses.. The finale catches you up in its drama and poignancy whereas some of the previous episodes (movies 4 and 6 in particular) provided increments of snooze time for me - and I very rarely nod off at the movies! On second viewing it occurred to me that outlying structure that gets torched is the Quidditch stadium - and I had to laugh at that too! Excellent thoughts here. You mentioned some of the sly cinematic flairs that permeate this film, which, even with its slight faults, was utterly beautiful to look at. I read the first book years ago and was generally unimpressed; it's just not my style of storytelling or literature. I saw the first two films and enjoyed them pretty well. But the true testament to Deathly Hallows Part 2 is that I was captivated and on the edge of my seat, so to speak, even without knowing the majority of the series' back story. That's a compliment to the filmmakers, who were able to make an excellent film that pleased even people who are not Harry Potter fans.